Florida's coast is home to many unique populations of wildlife. The TCPalm recently reported that sea turtles are nesting in record numbers on the Treasure Coast. This is exciting news for residents and visitors alike; however, protecting this population is crucial. Check out these fun and helpful facts about Florida's sea turtles, and do your part to keep them safe. Baby sea turtles have a long road from hatching to getting back to the water. One of the reasons it is crucial for Floridians to be aware of sea turtle populations, is that females lay their eggs on the beach, which makes them susceptible to disruption from beach-goers. Of course, once the eggs hatch, the baby sea turtles then need to find their way back to the water -- a perilous journey with predators watching closely. Female loggerhead turtles can lay over 100 eggs in just a single nesting -- many of which will never survive. For the most part, female turtles make their nests and lay their eggs at night and their eggs will typically also hatch in the middle of the night. This means that you're unlikely to encounter a sea turtle during the day. But if you should, it's important to avoid disrupting their path. Both baby sea turtles and mothers rely on instinct during this period, so your presence can easily distract them. This rarely ends well for the sea turtle. The reason the sea turtle population in Florida is booming is that there have been serious conservation efforts taken to reduce harm to females and newborns. 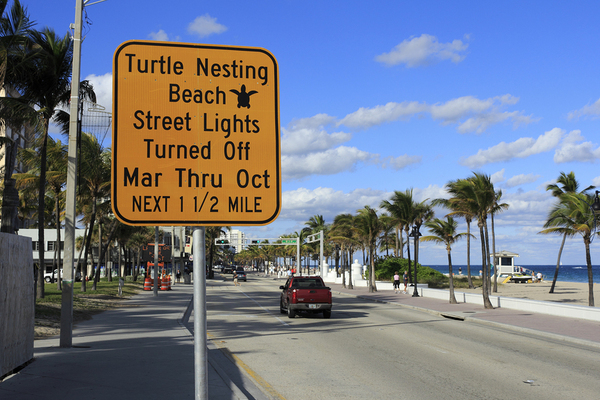 Light, in particular, can disorient turtles, so many coastal areas use reduced lighting during mating season so that babies make it to the water, not to the street. Many coastal cities now take significant precautions to protect sea turtle populations. 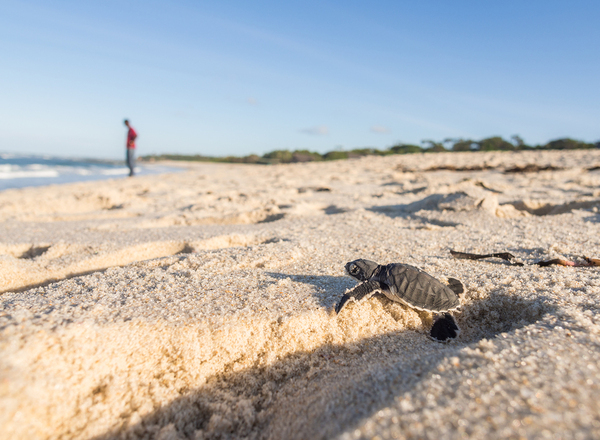 Despite their small size, newborn sea turtles are faced with an Ironman-style adventure before they even make it to the water. Once they hatch, the babies must dig themselves out of the hole in the ground that the female laid her eggs in. Just the process of getting out of the nest can take a few days, and then the babies must make it safely to the water. Unfortunately, the hot sun, a host of predators, and of course, the presence of humans are all obstacles to a sea turtle's survival. Unfortunately, all North American varieties of sea turtles are currently listed as threatened or endangered. In part, this has been due to the massive developments that have occurred up and down Florida's coast over the last decade; hence, the importance of Florida residents and visitors being aware of sea turtle season, and what they can do to help. There are a number of organizations that you can get involved with that help protect nesting areas and beaches during the season, but it's most important to remember that if you ever find a sea turtle or nest, do not disrupt it, and contact local organizations that can help protect the nest from damage. You'll be helping save Florida sea turtles for generations to come! Florida's unique coastal wildlife is only one of the reasons that it is an excellent state to call home. Get connected with a Florida bank that knows how to protect you and your finances, and contact us to learn more.